Wolverhampton betting tips page with all the Wolves Racecourse facts to assist you with your tipping and Wolverhampton betting. If you want to be on the right side of your wagers check out all the stats and facts below. There will be informative horse racing tips from OLBG members with plenty of helpful advice that will assist all punters, whether you are a novice or an expert at Dunstall Park. Wolverhampton has grown in importance since its first All-Weather meeting in 1993. Of the 7 current All Weather tracks, Wolverhampton held the most meetings in 2017 so it can really pay horse racing tipsters to follow Wolverhampton form lines. In 2015 the fibresand track was replaced by a Tapeta surface, trainers, jockeys and owners seem satisfied with the new surface for their horses and the standard of runners at the West Midlands track has improved in recent years. Wolverhampton Highlights: The big race at Wolverhampton is the Listed Lady Wulfruna stakes, run in March around the same time as the Cheltenham Festival, it seems flat trainers look at the prize money on offer at the Festival and come over all envious and target this valuable flat race (£28K). The winners over the last few years have come from the big flat stables, of William Haggas, Mark Johnston and David O’Meara. The winner of the Lady Wulfruna tends to go for the All-Weather Mile Championship (£98k) at Lingfield in April. Wolverhampton also holds some valuable handicaps for horses primed to run in the early season Lincoln Handicap at Doncaster, as well as some end of season Class 2 Nurseries for 2 Year old's. If you are visiting Wolverhampton races today then be sure to download the OLBG app for all the latest Wolverhampton tips at the course. 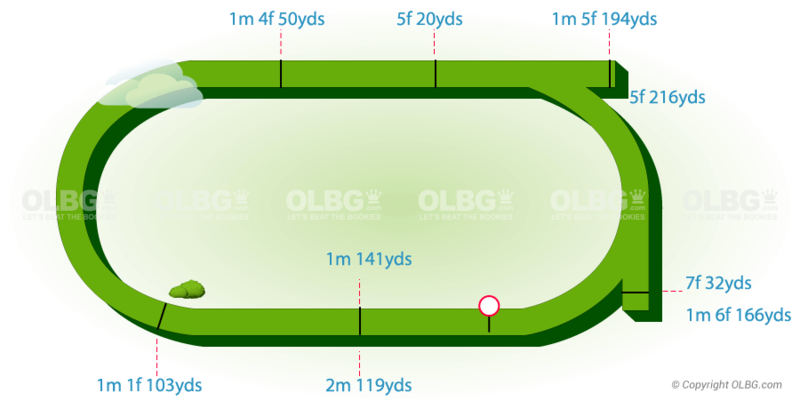 Left handed, oval circuit with tight bends and a short 2 furlong straight. The start for races run over seven furlongs and one mile six furlongs are from a chute just after the first bend after the winning post. Tapeta Surface: As mentioned above the synthetic surface was changed to tapeta here in 2015 which is the same as Newcastle's all weather track but different from the polytrack at Chelmsford, Kempton, Lingfield and the fibresand at Southwell. Wolverhampton's surface tends to ride a bit quicker than the tapeta at Newcastle, perhaps possibly due more to the layout whereby Newcastle has a long straight and stamina seems to be more important. Draw Advantage: Over 5 Furlongs it is best to be drawn low, ( Stalls 1-4). A check of the 5-year stats shows in 12 runner fields over 5 furlongs you were twice as likely to win from stall 1 than stall 12. Overall distances up to a mile its better being drawn low (1-6) than middle or high (7-12). A check of all races up to a mile in 2017 showed you were more than twice as likely to win the race from 1-6 than 7-12. You need to be in a good position off the final turn, and in many cases not too wide. Races run over seven furlongs and one mile and six furlongs start from a short chute just after the first bend (after the winning post). The run to the first bend is very short so a slow break particularly in seven furlong races can put paid to any chance especially if usually a prominent runner. Who are the best jockeys and trainers to bet on at Wolverhampton ? Mark Johnston has overtaken David Evans at the top of the numerical winners list with 81 from 491 runners over the past five seasons. OLBG tipsters adding tips on all Mark's runners here would have returned a heavy level stakes loss for that same period, focusing solely on his handicap runners would improve the strike rate and level stakes loss considerably. For Wolverhampton tips look to the powerful Newmarket stables of John Gosden, Saeed Bin Suroor, Roger Varian and Hugo Palmer when they send runners to Dunstall Park.